The ACCUSPLIT AX602R Stopwatch is a multi-mode, 100 Memory advanced timing stopwatch with the best WOS functions and features to provide you with the highest quality timers and stopwatches available The ACCUSPLIT AX602R Stopwatch is great for Event Timing . Extremly large digits for easy viewing on the field, track, or by the pool add to the appeal of ACCUSPLIT AX602R Stopwatch. All AX Pro Series Stopwatches are cased in Accusplit's distinctive, ergonomic designed "X" Case. 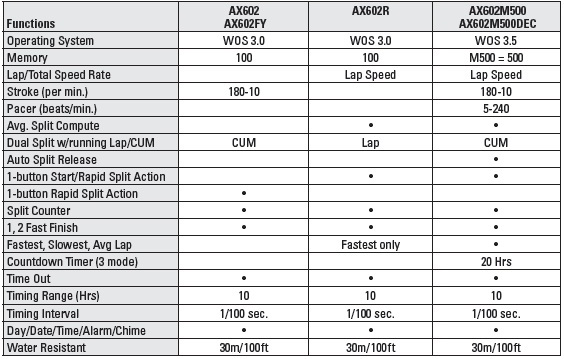 The AX602R is a 100 memory stopwatch with three line LCD display. 1/100th second, 100 memory, dual split stopwatch. Three line LCD display shows current split time, lap time, and running LAP time. Accusplit's "X4" stopwatch case gives you larger display digits, improved water resistance, plus our ergonomic, million-cycle no-fail buttons. PERFECT FOR RACING OR SWIMMING - has "Fastest Lap" feature and shows current running LAP time (unlike most other watches)! Click the button below to add the ACCUSPLIT AX602R Stopwatch 100 memory to your wish list.